Astilbe /əˈstɪlbiː/ is a genus of 18 species of rhizomatous flowering plants within the family Saxifragaceae, native to mountain ravines and woodlands in Asia and North America. Some species are known by the common names false goat's beard and false spirea. These hardy herbaceous perennials are cultivated by gardeners for their large, handsome, often fern-like foliage and dense, feathery plumes of flowers. They are widely adapted to shade and water-logged conditions, hence they are particularly associated with pond-side planting. They also tolerate clay soils well. Numerous hybrid cultivars have been raised. Flowers of at least some Astilbe species have a strong and pleasant aroma. Some species, including Astilbe rivularis, are used in traditional medicine. 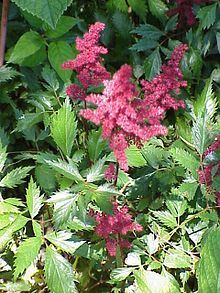 Wikimedia Commons has media related to Astilbe. ^ O'Neill, Alexander; et al. (2017-03-29). "Integrating ethnobiological knowledge into biodiversity conservation in the Eastern Himalayas". Journal of Ethnobiology and Ethnomedicine. 13 (21). doi:10.1186/s13002-017-0148-9. PMC 5372287. Retrieved 2017-05-11. ^ a b c English Names for Korean Native Plants (PDF). Pocheon: Korea National Arboretum. 2015. p. 367. ISBN 978-89-97450-98-5. Archived from the original (PDF) on 25 May 2017. Retrieved 24 December 2016 – via Korea Forest Service. ^ "RHS Plant Selector - Astilbe 'Brautschleier'". Retrieved 8 June 2013. ^ "RHS Plant Selector - Astilbe 'Bronce Elegans'". Retrieved 8 June 2013. ^ "RHS Plant Selector - Astilbe chinensis var. pumila". Retrieved 8 June 2013. ^ "RHS Plant Selector - Astilbe 'Fanal'". Retrieved 8 June 2013. ^ "RHS Plant Selector - Astilbe glaberrima var. saxatilis". Retrieved 8 June 2013. ^ "RHS Plant Selector - Astilbe 'Rheinland'". Retrieved 8 June 2013. ^ "RHS Plant Selector - Astilbe simplicifolia". Retrieved 8 June 2013. ^ "RHS Plant Selector - Astilbe 'Sprite'". Retrieved 8 June 2013. ^ "RHS Plant Selector - Astilbe 'Straussenfeder'". Retrieved 8 June 2013. ^ "RHS Plant Selector - Astilbe 'Perkeo'". Retrieved 8 June 2013. This page was last edited on 1 April 2019, at 11:28 (UTC).